Jamestown sportswriter Cody Crandall felt like he hit a grand slam when UR Medicine transplant cardiologists shared news that a matching heart was available for him. The 24-year-old former baseball standout at Jamestown High School waited more than six months for a new heart at UR Medicine’s Strong Memorial Hospital, and just hearing the words felt like a victory. Cardiac transplant surgeons Igor Gosev, M.D., and Sunil Prasad, M.D., chief of Cardiac Surgery, along with anesthesiologist Ahmed Khan, M.D., performed the May 16 surgery. Surrounded by his parents, John and Lisa Crandall, relatives and friends, Crandall has a long road ahead to regain strength and endurance. 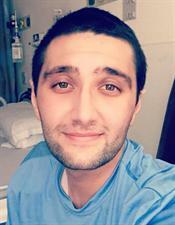 “Cody’s positive attitude and inner strength have helped him to achieve a speedy recovery,” transplant cardiologist Himabindu Vidula, M.D., said. She is part of the Advanced Heart Failure program, which provides patients with medical, mechanical and transplantation care. Crandall’s health crisis began last August. He was exhausted and plagued by a persistent cough that progressed to breathing difficulty. Testing showed an enlarged heart and cardiologists in Pennsylvania diagnosed viral heart failure. He was flown to Strong Memorial Hospital, upstate New York’s only site for comprehensive care for heart failure and heart transplantation. The SUNY-Fredonia graduate is excited to be home and begin his second chance at life, thanks to the generosity of an organ donor. He is interested in raising awareness of the importance of being a part of the state’s organ donor registry. Recently, New Yorkers were given the opportunity to register online, which has resulted in an increase the number of people committed to donation. Go to passlifeon.org or donatelife.ny.gov to register.